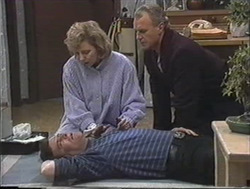 Des is lying unconscious on the floor and Beverly demands to know what's going on. 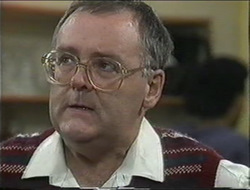 Jim explains that he thought Des was a burglar and so hit him with a golf club. Bev explains that he was just using their bathroom, and Jim is a bit annoyed that no-one told him. I'd be more concerned about your unconscious friend personally. Bev checks him over – Jim could have killed him! Madge and Eddie are up late doing posters and pamphlets for the bottomless cup of coffee. Harold can't believe they're still up. There's a knock at the door. Harold opens it and it's Kerry who was putting the bins out? I got the impression this was the middle of the night, but perhaps not! Kerry just popped round to see if Harold and Madge could look after Sky and Toby while her and Joe make use of the prize he won from the darts game – a honeymoon suite at Lassiters. Well, of course, they'd love to. Harold retires to bed, and Madge goes too. Kerry things she should head off, the rest of the street is probably sound asleep...! You wish, Kerry. Des is coming round. Beverly explains to him what's happened and Jim apologises. Des isn't too happy, and looks a bit delirious. Bev reckons he needs to get to hospital for stitches (oh yes, for that pool of blood that *isn't* on the floor) and a general check over. 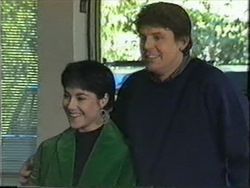 Beverly can't believe Jim – even if it had have been a burglar what he did could have been fatal. Kerry and Joe are really looking forward to spending some quality time together. The couple in front of them are having problems though – they can't afford the only room Lassiters have free and they need somewhere to stay as the other hotel made a mess up. They apologise for holding Joe and Kerry up and the woman begins telling Joe and Kerry how this was meant to be their honeymoon. She begins to cry because she thinks they might have to go home. 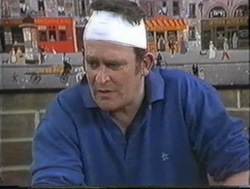 As Des walks in Paul remarks that he should be wearing a flag, not a bandage, on his head so that the golfers know where to aim. Des isn't amused. He says he still has a terrible headache and Madge doesn't think that sounds too good. Jim apologises again. JIM: I don't know what else to say. Jim leaves and Paul says that he is genuinely sorry about it all. Des asks for a coffee, and although Harold thinks he should stay away from caffeine, Des insists. Josh speaks to Madge about the flyers he's been delivering – he has loads left over. Madge tells him to hand out the remainder to his school friends. Madge leaves and Josh gives a couple of handfuls to the guys at one of the tables – telling them to give them to all their friends. Harold looks on. Des and Paul come in and Des offers Paul a beer. 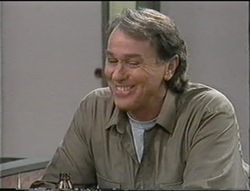 He introduces Paul to Doug, who laughs at Jim's camping skills with Paul. They then all laugh about Des getting hit with a golf club. Doug wishes he could have been there to see Jim's face. Des checks on the price that Doug quoted him – and Doug says it's going better than he thought, he even managed to get some of the materials cheaper than he'd originally planned. Joe and Kerry and snuggled up on the floor with duvets together. They gave away their honeymoon suite to the young couple (surprise surprise!). They talk about Toby and how good it is that he was keen on Kerry fostering him. Kerry feels a kick from the baby and her and Joe begin to talk about names. Joe thinks her suggestions of ‘Bliss' or ‘Jera' (I think anyway, I can't quite hear them properly) are ‘shocking'. Madge stops by with Sky and gloats because Harold and Eddie have had many customers – a lot from her leaflet idea! Seeing Jim and Beverly load the golfclubs into the back of the car, Doug cracks a few golfing jokes. Whilst Beverly laughs at them, Jim looks annoyed. Kerry and Joe are still arguing over baby names. Kerry doesn't think Joe is being very adventurous, as he wants names like Joseph or William. Kerry however is more keen on Willow or Harmony. There's a knock at the door and Kerry reluctantly answers it. It's Des who is surprised that they're home. Joe tells him the story about giving away the suite and Des thinks that was really good of them. He's pleased anyway because he feels like a gooseberry at home with Melanie and Roger so he's going to stay and chat with them. 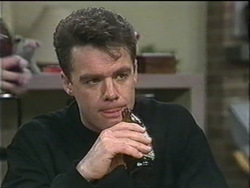 Joe asks what names did Des almost have for Jamie and Des says “Steve or Margret”. Joe thinks they are excellent names for children and Kerry looks bored. Harold's round and they're still talking about baby names. Joe thinks that the traditional names are better than the new and modern ones and Harold agrees. KERRY: I've never met such a bunch of old fuddy duddys . KERRY: What is this? A railway station?! It's Eddie, who also chips in about names. He's in agreement with Kerry. While Eddie and Harold battle it out Joe pulls Kerry aside and apologises for getting all these people involved – so much for a quiet night together! Joe has an idea...and they sneak off together. Madge has come in to help Harold and Eddie deal with her predicted rush. Harold moans about the members of the council which are there having a meeting with their bottomless cups of coffee leaflet. They've been there ages and are only buying sandwiches which doesn't make up for the coffee they're drinking! Beverly laughs as Jim walking in with a bike wheel. He explains that he's going to do up Paul's old bike and use it to get in trim and get some exercise. Harold is annoyed with Madge about the bottomless cup of coffee. 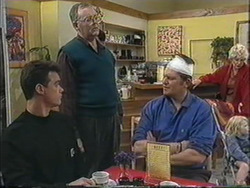 When Doug asks for another coffee, Harold tells him he needs to order food – as the leaflets say. But on closer inspection of the leaflet, Harold sees that it doesn't say that. He's mad with Madge, who admits that about 500 leaflets went out in total. They could be ruined!